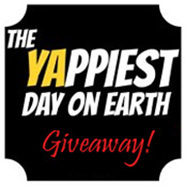 This is the 12th YAppiest Giveaway! 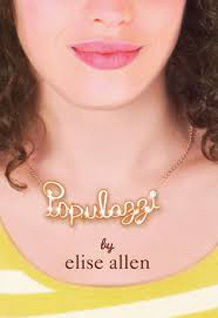 for Populazzi, by Elise Allen. For a chance to win a FREE copy of this book, see the “Here’s How” section below. For a complete list of upcoming giveaways, go here. What would you do if you could re-invent yourself? Cara and Claudia met kindergarten, when an embarrassing incident cemented their friendship and put them at the bottom of the social ladder … through high school. Cara and Claudia dream of being one of the glittering few at the top of the popularity tower, one of the Populazzi. But there’s no chance that dream will ever become reality in the small town where they live. But all that changes for Cara in her junior year, when she moves to a new school. Claudia insists it’s Cara’s chance; that she has to take this opportunity to climb the popularity Ladder. Claudia spent months researching The Ladder, and presents Cara with the bulletproof formula for social success. It’s simple,eEarch rung on the ladder is a relationship. All Cara has to do to climb to the top of the ladder—and become a Populazzi—is to transform into the perfect girlfriend for guys that are higher up the ladder. The trick is using her current relationship to hook the next guy, one higher on the popularity tower. Cara isn’t thrilled about The Ladder the way Claudia is; she doesn’t even think it will work. But since Claudia has been her best friend since forever, Cara follows the rules Claudia has laid out for her. What starts out as lighthearted social experiment—that actually works—quickly turns into a downward spiral into becoming a person Cara never thought she could be. When the worst thing possible happens, ruining everything she’s worked for and hurting the people she cares most about, only a truly audacious act has the chance of setting things even a little bit right for Cara. It’s easy—at any age—to look at someone from afar and think their life is perfect. Up close the reality is often anything but. Cara gets glimpses of this as she rises up the Ladder, but the brutal truth doesn’t register until it’s too late. The truth is, it’s lonely at the top because the people who act like friends will do anything to push you down and take your place. Through Cara’s sharp and sensitive first-person narration we experience the highs and lows of her pursuit for what’s ultimately intangible: popularity. Cara, Claudia, and the main characters at Cara’s new school are all unique, well-defined, and easy to relate to. Cara’s parents are an interesting juxtaposition to Cara and Claudia. They are just far enough over the edge to win Cara our empathy, but not far enough over for us to hate. What I liked most about Populazzi is how Cara’s envelope is pushed in every way possible, making me laugh, cringe, and cry, while keeping the plot fresh. Leave a comment on this blog–explaining WHY you want to read this book— by midnight, October 6th (1 entry). I’ll tally the entries and choose a winner, then announce it on this blog on Tuesday, October 8th. Good luck!